* marketing and public relations. I feel that the culture of librarianship is distinctly different from other information professions such as computer scientists and IT folks. Our helping culture generally is something I treasure about the profession, though I also recognize that we can easily tip over into what current psych-lingo characterizes as co-dependent behavior. Basically, that means, we over-help patrons, making their problems our problems. But overall, I am very proud to belong to such a service-oriented profession. We are collaborators and helpers, and that is good. “The Crux of Our Crisis,” by John Philip Mulvaney and Dan O’Connor, American Libraries, vol. 37, No. 6, June/July, 2006, pp. 38-40. “Why Survival is Not Enough,” by Richard J. Cox, American Libraries, vol. 37, No. 6, June/July, 2006, pp. 42-44. The authors lament the lack of consensus on a core curriculum and central values for library schools. I followed up their comments by looking at the ALA, ALISE and AALL websites for statements of core competencies and values. While there is no core curriculum in the ALA accreditation standards for library and information science schools, I did find several statements of core competencies. I think the vagueness is largely due to the incredible speed with which information technology is developing and changing now. My colleague at Suffolk who directs the university library is an adjunct at Simmons School of Library and Information Science, and recently commented that he thought the MLS as a requirement for librarianship was dying. So, what do our professional organizations say it takes to be a librarian? Well, ALA and AALL do require a master's degree in library science. Oddly enough, though, it seems that teaching in a library and information science school does not require a library science degree. Neither ALA nor ALISE (Association of Library and Information Science Education) require a library or information science degree in order to teach in such a program. The articles cited above specifically mention a trend in library schools to employ professors with non-LIS degrees. The curriculum is concerned with recordable information and knowledge, and the services and technologies to facilitate their management and use. The curriculum of library and information studies encompasses information and knowledge creation, communication, identification, selection, acquisition, organization and description, storage and retrieval, preservation, analysis, interpretation, evaluation, synthesis, dissemination, and management. Although these general competencies are required by librarians employed in all types of libraries, library instruction must also include and emphasize the components of these areas that are specific to law librarianship. * A master’s degree in library science usually is required; special librarians may need an additional graduate or professional degree. * A large number of retirements in the next decade is expected to result in many job openings for librarians to replace those who leave. * Librarians increasingly use information technology to perform research, classify materials, and help students and library patrons seek information. 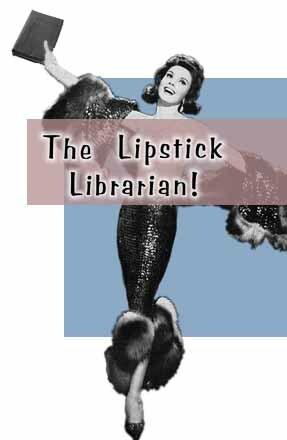 The Lipstick Librarian (yay!) link explains that librarians in the 19th century were envisioned as "handmaidens of the library." LL states that lipstick librarians decided they would rather be "mistresses of the library" and fashionable ones at that! Terry Pratchett, author of the Discworld fantasy series, has the Librarian at the Unseen University for wizards as an orangutan. Pratchett posits "L Space" in the library, allowing infinite shelving into multiple dimensions (how handy to solve space problems!). The Librarian was turned into an orangutan by the influence of so many magical books, but since he's the only one who knows where all the books are, and can so easily reach the high-up shelves, he retains his position. And of course, Nancy Pearl, of the Seattle Public Library and Book Lust, both the book versions and the National Public Radio show, is the model for the "Librarian Action Figure" from Archie McPhee and Co. Librarians are a sometimes a bit irritated at the shushing, dowdy stereotype that some saw embodied in the figure. But Nancy Pearl is librarianship's rock star figure these days. Here is a link to another, "Warrior" librarian action figure. Evidently based on a character, Giles, from the Buffy the Vampire television series. And there are also Marion the Librarian from The Music Man, Conan the Librarian and countless librarian images, stereotypical or not. I think our profession is generally given credit for being selfless, public-spririted and well-educated. Overall, that's not bad -- though better-paid would be nice to add. Do you have an opinion on how to define our profession? I'd love to hear your thoughts! My original vision of a librarian would have been somebody who helps people use a library, whether that be face-to-face help, or behind the scenes cataloguing, indexing, processing things so the library users can actually FIND things, whether with someone's help or not. Thus the service ethic you discuss. That idea very much shifts as our sources of information become increasingly electronic, and the library is increasingly virtual. If there is no physical library, can one still be a librarian? Even if the physical library is no longer there, the expertise in using information sources and the service ethic do still remain. What I find most disturbing is the increasing trend that one cannot be a librarian (a law librarian, specifically) unless one has a law degree. I don't see hospitals requiring their librarians to have medical degrees. I can understand selecting a candidate with both library and law degrees for a position since that is obviously desirable, but I'm having an increasingly difficult time accepting it as an absolute requirement. Some law library positions require a different skill set than one would obtain in a law degree. I would think an MBA would be more helpful in some cases to be honest. Perhaps it is time for a law librarian MBA? But I digress...I see librarianship as a profession and a vocation. I love the variety of work, and the constant evolution of my role as I take on new responsibilities both within my organization and in serving others in my profession. And we all have such varied experience, it is becoming increasingly difficult to define what we are. To be honest, I kind of like it that way. Thank you for your terrific comments! It's always a pleasure to hear from you. I, too, love the variety; every day is different! And I agree with you about the JD requirement. Some of the very best reference folks I have known have not had the law degree. These are people I call if I get stumped. But I work at a law school, and that's where the real drive for the double-degree librarians comes in. If we, who grant the degrees, don't give it some extra weight, what the heck are we in business for? I would never want to put down the single degree library geniuses I have known, but I do support having double degrees in reference and director positions in law school libraries. Can you tell me where 'Handmaidens of the library' comes from, I'd like to quote it in an essay. Pink Conversation: Can Men Be Pink? Bar exam on legal research?